December 22, 2012 - “What I am about to tell you is something you’ve probably never heard or read in history books,” she likes to tell audiences. 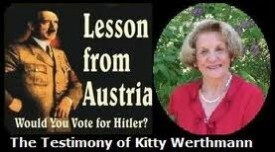 “In 1938, Austria was in deep Depression. Nearly one-third of our workforce was unem- ployed. We had 25 percent inflation and 25 percent bank loan interest rates. “Hitler decided we should have equal rights for women. Before this, it was a custom that married Austrian women did not work outside the home. An able-bodied husband would be looked down on if he couldn’t support his family. Many women in the teach- ing profession were elated that they could retain the jobs they previously had been re- quired to give up for marriage. “It seemed strange to me that our society changed so suddenly. As time went along, I realized what a great deed my mother did so that I wasn’t exposed to that kind of hu- manistic philosophy. “When the mothers had to go out into the work force, the government immediately es- tablished child care centers. “If you needed elective surgery, you had to wait a year or two for your turn. There was no money for research as it was poured into socialized medicine. Research at the med- ical schools literally stopped, so the best doctors left Austria and emigrated to other countries. “ Government officials told him he had to replace them with round tables because peo- ple might bump themselves on the corners. Then they said he had to have additional bathroom facilities. It was just a small dairy business with a snack bar. He couldn’t meet all the demands. “So people intermarried and offspring were sometimes retarded. When I arrived, I was told there were 15 mentally retarded adults, but they were all useful and did good man- ual work.